The following breeds of rare livestock ducks are found in New Zealand. Click on the desired breed for details. The Aylesbury, which originated in the Buckinghamshire town of that name, is generally regarded as the ultimate in meat breeds. As would be expected, it is one of the largest ducks, and it has pure white, glossy feathering, orange legs, and a pinky-white bill. At their most popular in the eighteen-sixties and seventies, up to 2,000 ducklings could be seen around individual breeders’ cottages in Aylesbury township, and more than a ton weight of birds was sometimes railed to the London market in a single night. The eating of ducks has never been as popular in New Zealand as in Europe or Britain and today’s Aylesburys, while still excellent meat birds, seldom approach the size and type of those of the original breed. 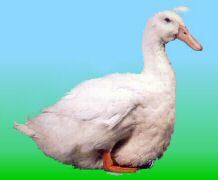 This is a heavy duck – essentially a meat breed. It is believed to have originated in Sweden, but it has never been common except in Germany and Scandinavia. Its colour is slate-blue with a white blotch on the throat and upper breast. The Campbell – almost universally called the Khaki Campbell, although it comes in other colours – was recognised as a breed in 1901, and introduced to New Zealand not long after. It was developed by a Mrs Campbell of Uley in Gloucestershire, essentially as a laying duck (it has Indian Runner in its makeup). Its prime characteristic was its delicately flavoured white egg, although the duck itself was also recognised as being good eating. 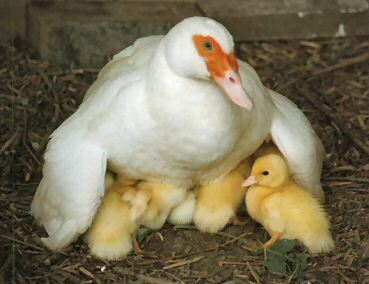 In the 1920s the record for the longest unbroken sequence of eggs laid by any bird was held by a Khaki Campbell duck. Although not as spectacularly coloured as some breeds, the Khaki Campbell is an attractive duck with its warm khaki-brown hues and greenish-bronze head and wing bars on the male. The exact origins of the black Cayuga duck are unclear. It is named after Lake Cayuga in New York State, where it was first officially recognised around 1850. Some fanciers believe it originated there as a sport from the Mallard, but it has also been suggested that it was bred in South America from the small black ‘East Indian’ duck. It is a moderate egg-layer, a good table duck, and most will hatch their own eggs if allowed. Its colouring is an all-over lustrous, metallic green-black often referred to as a beetle-green. Both Britain and Holland claim to have developed the Crested duck originally; it is possible that it evolved in both countries independently. Breeds descriptions note it as a heavy duck, rather similar in shape to the Aylesbury. Its dominant feature – as the name implies – is the round crest of feathers worn on the back of the head. It comes in a variety of colours. Rare in New Zealand. In colouring it somewhat resembles the Welsh Harlequin, but it is a smaller, stockier bird. It is quite a good layer, but at present is mainly kept as an interest breed. The Indian Runner is the only duck in New Zealand bred exclusively as an egg-producer. In its heyday the Indian Runner was the ultimate egg machine, with laying records that greatly exceeded those of any hen. 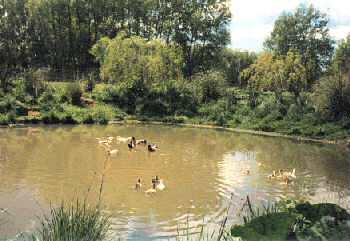 An official world record of 363 eggs in twelve months was established at Papanui in Christchurch early last century by a Runner duck, which on several occasions laid two eggs in one day. Around the same time, a team of five Indian Runners laid 2887 eggs over a two-year test period. The Runner originated in Malaya (as it was then called) and was introduced to Britain in the 1870s. It is a slim, upright, active duck with relatively long legs, which should walk or run without the roll or waddle of most ducks. Fanciers have tended to breed to exaggerate this stance and have been accused of aiming for "Too much Runner and not enough Duck!" The Indian Runner comes in a variety of colours, although the original Malayan birds were fawn and white. The Magpie is a British duck developed in Wales a century ago. It is a big dual-purpose bird but at the same time is very active. It comes in two colours, the black and white and the blue and white, although the latter is very rare. The Muscovy duck (which doesn’t come from Moscow as the name implies, and is almost as much a goose as a duck) originated in South America and is a distinct species. The name is a corruption of ‘Musk Duck,’ from a supposed musky odour emitted by the drake. It has also been known as the Brazilian duck. The Muscovy is a large bird, the drake is much bigger than the duck and almost twice the weight of drakes of the Mallard-derived breeds. It is powerfully built with long wings and tail, and it flies well. It was William Cook of Orpington in Kent (who developed the Orpington breed of chooks) who also developed the Orpington duck early in the twentieth century. It had excellent laying qualities (it has Indian Runner in its makeup) as well as being superb eating – a result of its Aylesbury and Rouen ancestry. The Orpington is quite a heavy breed and the Buff variety is most attractive with its rich red- or golden-buff colouring and orange legs and beak. The drake displays a glossy seal-brown head and neck. There is also a Blue Orpington duck, but it is much less common than the Buff. The Pekin was first introduced from China, to both England and the United States, in 1873. It has been said that its colour, great size and striking shape made it more popular in less time than any other domestic poultry ever introduced to Britain. Broad in the beam and with a curiously upturned tail, the Pekin is traditionally described as boat-shaped but a bit down at the stern. The original colour, too, was unique in ducks and is almost universally described in early publications as ‘canary yellow,’ although it seems actually to have been more of a deep cream. Despite the efforts of breeders to maintain that colour, the standard Pekin today is creamy-white (it should never be pure white) with bright orange bill, legs and feet. Pekins are moderately good egg-producers and one of the best breeds for eating as ducklings. 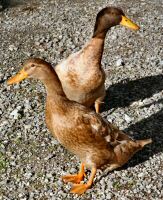 The Rouen (or Rhone) ducks were developed centuries ago in the Rouen area of Northern France. In appearance they are essentially a much larger, domesticated version of the wild Mallard, the drake in breeding plumage displaying the typical Mallard colouring, iridescent green head, white neck ring, claret breast, blue wing bars, and body of French grey and glossy black, highlighted with white. It is a spectacular bird which adds a bright yellow-green bill and brick-red legs and feet to its already noticeable appearance. The female is brown with darker pencilled markings, also a handsome bird. The Rouen is quite a big duck. Bred essentially for the table it is nevertheless quite a good layer. It is often kept also simply for its beauty. A most attractive duck which sports the basic Mallard colour pattern but with a marked silvery-grey colouring to the male’s back, while the female is an over-all silver-brown. Developed as a dual-purpose duck, but usually kept for ornamental purposes. This striking breed was developed around 1950 from the Khaki Campbell. The drake has a basic Mallard colour pattern with green head, white throat ring and russet breast, but the back is mottled brown and cream. The duck is more fawn and cream with black mottling. The original Harlequin was claimed to be a better layer than the Campbell and to be very quiet and easily managed.